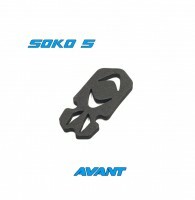 The AVANT Xero S2M is a lightweight 2" Stretched X designed to support the Runcam Micro Swift or any micro camera with 18.5-19.5mm mounting pattern. It features a solid "Chamfered" 3mm unibody 3K twill weave carbon fiber main plate cut in 45 degs , 1.5mm top plate and camera mounting plate for simple construction and durability. Motor to motor length is at 120mm and is capable to support any popular 1104-1106 motors with mounting pattern 9mm x 9mm. This quad is capable to spin any props up to 65mm in diameter and camera can be tilted up to 65 degs. Bare frame + hardware weighs 23g. "The motor mounting area has been revised with 3 mounting holes"
XERO S3M Frame Kit (Unibody) "11xx-size motor"
Click the button below to add the XERO S2M (3mm Unibody) to your wish list.